Appropriate placement and movements of the trocar avoids bleeding complications for BKP. Department of Orthopaedics, Juntendo University School of Medicine, Tokyo, Japan. Department of Orthopaedics, Juntendo University, 2-1-1 Hongo, Bunkyo-ku, Tokyo 113-8421, Japan. Introduction: We encountered a patient with a reverse oblique olecranon fracture in whom redisplacement occurred after osteosynthesis using routine tension band wiring (TBW). In this case report, methods for stable fixation used during reoperation are reported with a review of the literature. 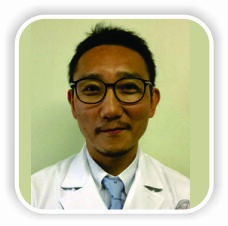 Case Report: A 60-year-old male got the left olecranon fracture (Colton classification, type 2A) visited our hospital. However, osteosynthesis using TBW was performed, soft wire breakage, K-wire distortion, and olecranon bone fragment displacement at 2 weeks after surgery. Reoperation was performed. TBW was performed using K-wires as intramedullary nails so that compression force could be applied as vertically as possible to the bone fragments. Furthermore, for further control of distal bone fragment instability, olecranon locking plate fixation was performed using a posterior approach. 12 months after the operation, the visual analog scale score was 2/10, Quick Disabilities of the Arm, Shoulder, and Hand score were 2.27/100, and the Mayo Elbow Performance score was 85/100 (good). Plain X-ray examination showed favorable bone union. Conclusion: In reverse oblique fractures, the compression force applied to the fracture site is weak because it is not vertical to the fracture line. Therefore, stable osteosynthesis cannot be performed, and post-operative redisplacement occurs. The combination of TBW and plates should be actively considered in reverse oblique olecranon fractures for which adequate fixation cannot be provided by TBW alone. Keywords: Reverse oblique olecranon fracture, Colton classification, tension band wiring, olecranon plate. As surgery for olecranon fractures, tension band wiring (TBW) or locking plate fixation is selected. Favorable post-operative results can be obtained using either technique for general fractures . In TBW, insertion of Kirschner wires (K-wires) as vertically as possible to the fracture line allows favorable compression force applied to the fracture site (Fig. 1). However, in reverse oblique fractures, the compression force applied to the fracture site is weak because it is not vertical to the fracture line. Therefore, stable osteosynthesis cannot be performed, and post-operative redisplacement occurs . Therefore, we consider that reverse oblique olecranon fractures appear to be simple fractures but are one of the injuries challenging to treat. We encountered a patient with a reverse oblique olecranon fracture in whom redisplacement occurred after osteosynthesis using routine TBW. In this case report, methods for stable fixation used during reoperation are reported with a review of the literature. A 60-year-old male with nothing of note in his medical history visited our hospital due to pain in the elbow joint resulting from a motorcycle accident. 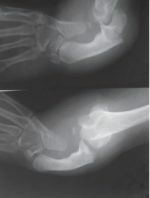 Based on plain X-ray findings, a diagnosis of a left olecranon fracture was made (Colton classification, type 2A) (Fig. 2a) . 3 days after the injury, osteosynthesis using TBW was performed (Fig. 2b). 2 weeks after the operation, he developed the left elbow pain after falling and revisited our hospital. Plain X-ray examination showed soft wire breakage, K-wire distortion, and olecranon bone fragment displacement (Fig. 2c). Reoperation was performed. The broken wire and scar tissue at the fracture site was removed, and the bone fragments were freshened (Fig. 3a). Subsequently, TBW was performed using K-wires as intramedullary nails so that compression force could be applied as vertically as possible to the bone fragments. 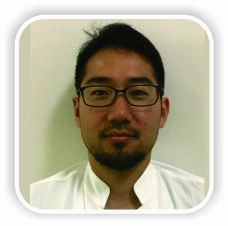 Furthermore, for further control of distal bone fragment instability, olecranon locking plate fixation (VA-LCP olecranon plate, Depuy Synthes, Tokyo, Japan) was performed using a posterior approach (Fig. 3b). At present, 12 months after the operation, the range of elbow motion is 130 for flexion, -10 for an extension, 85 for pronation, and 85 for supination. The visual analog scale score was 2/10, Quick Disabilities of the Arm, Shoulder, and Hand score were 2.27/100, and the Mayo Elbow Performance score was 85/100 (Good). Plain X-ray examination showed favorable bone union (Fig. 4a and b). Concerning surgical treatment for general olecranon fractures, Tarallo et al. reported a high rate (45%) of post-operative complications (such as wire loosening, skin disorder, infection, and non-union) describing that TBW is not a straightforward technique . 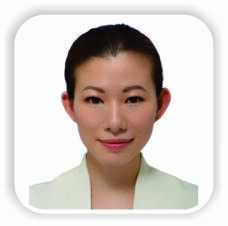 Therefore, there was a recent study recommending the active use of olecranon locking plates . There have been the following opinions about surgical treatment for reverse oblique olecranon fractures as was observed in this patient. Iga et al. reported that there is anterior instability of the distal bone fragment/ulnar diaphysis in reverse oblique olecranon fractures, and TBW alone is inadequate to control this instability . In addition, concerning whether K-wires should be used as intramedullary nails or transcortically placed through the anterior cortex, van der Linden et al. reported that K-wire instability developed in 75% of cases treated with intramedullary K-wires, and significantly favorable fixation could be obtained in cases treated with transcortical K-wires penetrating the anterior cortex . Therefore, in patients such as our patient with reverse oblique fractures, we considered that methods to achieve two directional favorable fixation (in the major and minor axis directions of the ulna) are necessary. Favorable fixation in the major axis direction of the ulna can be achieved using TBW. As a method to apply compression force as vertical as possible to the bone fragments, K-wires were used as intramedullary nails (Fig. 5a). Favorable fixation obtained using TBW could be confirmed during the operation, but the instability of the distal ulnar diaphysis remained as van der Linden et al. reported . To overcome the anterior instability of the ulnar diaphysis, which could not be controlled using K-wire intramedullary nails, the bone fragments of the diaphysis were posteriorly drawn using a posterior olecranon plate, and fixation in the ulnar minor axis direction was obtained (Figs. 3b, 4b, and 5b). When olecranon plates, mainly locking plates, are used, attention should be paid to the possible development of complications such as skin disorders . Some authors have the opinion that low profile plates instead of locking plates should be used . In our case, a locking plate was used, which is a limitation of our technique. Informed consent should be obtained from patients after an adequate explanation of the possible complications. When complications develop, coping including removal of intramedullary nails is necessary. Despite these disadvantages of olecranon locking plates, the combination of TBW and plates should be actively considered in reverse oblique olecranon fractures for which adequate fixation cannot be provided by TBW alone. In reverse oblique fractures, the compression force applied to the fracture site is weak because it is not vertical to the fracture line. Therefore, stable osteosynthesis cannot be performed, and post-operative redisplacement occurs. The combination of TBW and plates should be actively considered in reverse oblique olecranon fractures for which adequate fixation cannot be provided by TBW alone. In reverse oblique fractures, stable osteosynthesis cannot be performed, and post-operative re-displacement occurs. The combination of TBW and plates should be actively considered in reverse oblique olecranon fractures for which adequate fixation cannot be provided by TBW alone. 1. Ren YM, Qiao HY, Wei ZJ, Lin W, Fan BY, Liu J, et al. Efficacy and safety of tension band wiring versus plate fixation in olecranon fractures: A systematic review and meta-analysis. J Orthop Surg Res 2016;11:137. 2. Hume MC, Wiss DA. Olecranon fractures. A clinical and radiographic comparison of tension band wiring and plate fixation. Clin Orthop Relat Res 1992;285:229-35. 3. Colton CL. Fractures of the olecranon in adults: Classification and management. Injury 1973;5:121-9. 4. Tarallo L, Mugnai R, Adani R, Capra F, Zambianchi F, Catani F, et al. 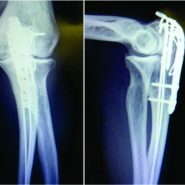 Simple and comminuted displaced olecranon fractures: A clinical comparison between tension band wiring and plate fixation techniques. Arch Orthop Trauma Surg 2014;134:1107-14. 5. Powell AJ, Farhan-Alanie OM, Bryceland JK, Nunn T. The treatment of olecranon fractures in adults. Musculoskelet Surg 2017;101:1-9. 6. 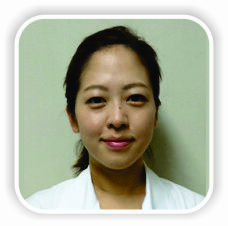 Iga T, Okazaki H, Sato W, Fukushima H. Reverse oblique olecranon fracture. J Jpn Soc Fracture Repair (Kossetsu) 2006;28:234-8. 7. van der Linden SC, van Kampen A, Jaarsma RL. K-wire position in tension-band wiring technique affects stability of wires and long-term outcome in surgical treatment of olecranon fractures. J Shoulder Elbow Surg 2012;21:405-11. 8. Patel J, Motwani G, Shah H, Daveshwar R. Outcome after internal fixation of intraarticular distal humerus (AO type B &amp; C) fractures: Preliminary results with anatomical distal humerus LCP system. J Clin Orthop Trauma 2017;8:63-7. 9. Gruszka D, Arand C, Greenfield J, Nowak TE, Kuechle R, Kuhn S, et al. 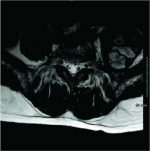 Is the novel olecranon tension plate a valid alternative to tension band wiring of olecranon fractures? A biomechanical study on cadaver bones. Arch Orthop Trauma Surg 2017;137:1651-8. 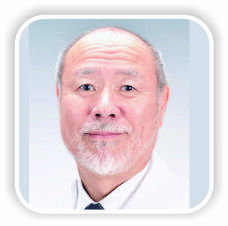 How to Cite This Article: Maeda E, Sugiyama Y, Kinoshita M, Naito K, Kaneko K. Devising Osteosynthesis for the Reverse Oblique Olecranon Fracture: A Case Report. Journal of Orthopaedic Case Reports 2018 Nov-Dec; 8(6): 82-84.